Cyclesnack: Where are these trails at? 29) Newtown Greenway System -The four primary corridors being designated include the Pootatuck River Greenway, the Lake Zoar Greenway, the Lower Paugussett State Forest Greenway, and the Huntington State Park Greenway. These corridors form an interconnected system of multi use trails radiating out from the center of town, linking many open space resources. What I would like to know is what are "these corridors from an interconnected system of multi-use trails" all about? Multi-use sounds like bikes (and horses of courses). I would like to try and ride all these trails and see what they are like. I have blown up the map below and taken a few educated guesses and what's what but it still raises a lot of questions. The Housi I know about, great river to canoe and fish on. Wondering how they address portaging over the Shepaug Dam. The Stephenson has a portage. Another given is Housi RR bed. Too bad that terminates at the townline (sort of). Trail (rail bed) actually continues on into Newtown but enters into a superfund cleanup site that isn't getting cleaned up anytime soon so I am wondering what this "Greenway" connects to. I know there is a river that parallels the active Housatonic RR tracks that flows into Lake Zoar, could that possibly the continuation of the greenway? Seems kind of stupid if you ask me. Am I supposed drag my canoe behind my bike? 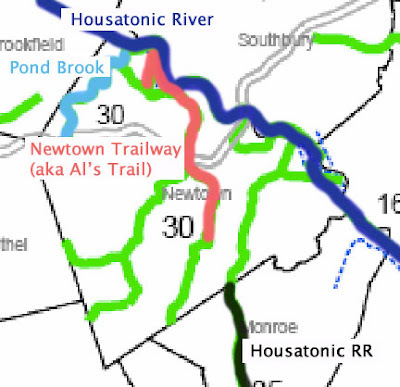 Another given is the Newtown Trailway (aka Al's Trail) which is probably part of the Pootatuck Greenway. If the Newtown Trailway is a multi use trail, which the Town often refers to it as, then does that mean it's open to bikes and horses? The Huntington Greenway, while not highlighted comes out of Bethel and Redding, but what I would like to know is what and where are these trails? I am also wondering whether the Pond Brook Greenway makes any mention of the old RR bed that follows the stream? Looks like Upper Paugussett State Forest is a hub for a lot of these greenways, however, I wonder what that one connector is between Al's Trail and Pond Brook? Hanover Road? Does anyone have a map of these trails? I have the Newtown Trails Book. I am going to dust it off and see how it corresponds to these greenways and possibly start creating my own Trails Map for the Town, once I am done with the Upper Gussy, that is.